The Philippines-Ateneo Blue Eagles caught fire in the second half and disposed of Indonesia, 89-78, at the 40th William Jones Cup in New Taipei City, Thursday, July 19. A trailing George Go (198-F/C-96) drained a pull-up triple from a Thirdy Ravena dump pass to knot up the contest at 55 with 5:25 left. In the next possession, Ravena rebounded and took the ball coast-to-coast for an easy drive and the lead, 56-55. A few possessions later, a now-fearless George Go sank his 5th long bomb of the day for a 61-60 advantage. George Go and Ravena bolstered the offense even further with two more consecutive 3-balls to complete a massive 18-2 run, 76-62. Overall, the white-hot Eagles outscored the Indonesians 35-18 in the 3rd frame alone. Veteran sniper Antonio Asistio (178-G-95) then piled on the Indonesian's woes, forcing a timeout after yet another triple for Ateneo-PH, 83-64. However, the trailing opposition did muster a quick 10-0 run to inch back within 9, 74-83. On the break, Ateneo's perimeter specialist Jolo Mendoza fired a transition 3 to finally stop the bleeding, 86-74. Indonesia made a nice run, but ultimately fell short of time to make another comeback effort. George Go was preserved down the stretch due to the tournament's daily games, but finished with a team-high 21 points, 4 rebounds, 2 assists, 2 steals and 6/7 (86%) shots from downtown in just 13 minutes of action. Ravena chipped in 14 points with 7 boards and 5 assists. New reinforcement big men Angelo Kouame and Patrick Maagdenberg (196-F/C-97) also came alive, both with 14 markers of their own. On the other end, it was import Kore White who led the Indonesians with a solid line of 23 points, 7 rebounds and 5 assists. Kaleb Gemilang added 18 markers, 5 assists and 4 boards of his own in the losing effort. 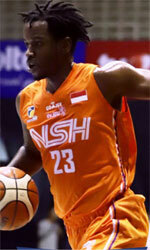 Indonesia rallied after being down 19-25 in the first quarter and ended the half up 3, 44-41. However, George Go at that point already had 3 treys for 10 points, and just went to work from there.